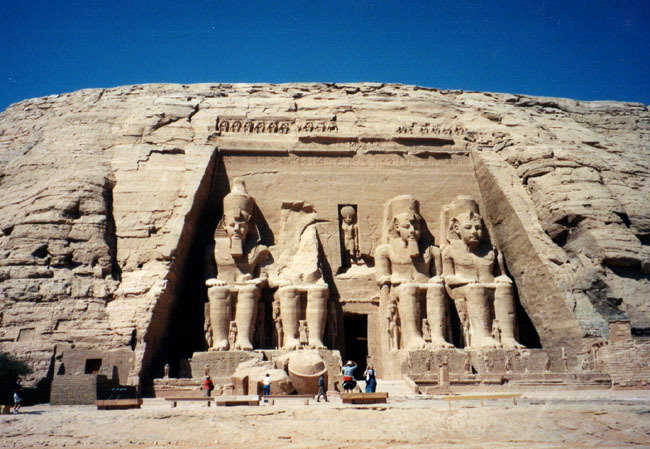 The two temples at Abu Simbel were built between 1269 and 1256 BC, early in the reign of Ramesses II (1279-1212 BC). Shown in this photo is the Great Temple, which was dedicated to the deified king. Politically, the temple anchors the southern line of Egypt's expansion into Nubia, and was intended to overawe the Nubians into acceptance of Egyptian hegemony. There is no doubt that the temples overawe the modern tourist. The facade of the Great Temple is 30m (90') high and 35m (105') wide, and the four colossal seated statues of Ramesses II at the entrance measure about 21m (60') high. The tiny visitors, shown in this photograph, give some sense of the magnificent scale of this monument. Abu Simbel lies about 200 miles south of Aswan and 20 or so miles north of the second cateract. Between 1964 and 1968, in order to preserve the temples from the rising waters due to the Aswan Dam, they were cut apart into huge blocks and reassembled nearby on higher ground. The temples were rebuilt inside two enormous artificial hills, at a cost of about $40,000,000.